You start off with a group of 4 citizens, some with certain specialities. 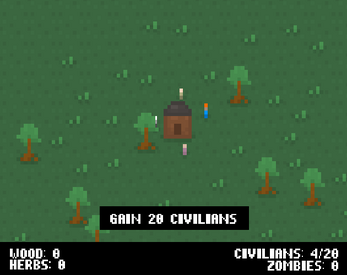 By clicking on a citizen, you can command them to move to a certain location. Normal citizens can break down trees and grass. Builders and planters both allow you to craft objects using the resources the normal citizens have harvested. To craft an object, right click on the builder or planter. 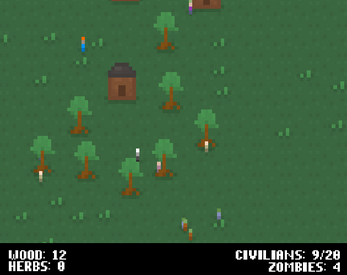 Warrior citizens will attack zombies. To make them attack a zombie, command them to move towards one, and they will attack it. Building houses will spawn new citizens. To win the game, have a civilisation of 20 people. Losing all normal citizens will cause you to lose the game.